IDEA: Want to appeal to young, attractive people who like watching other young, attractive people do insane stunts? Devin Graham is your man. The 30-year-old filmmaker, aka "devinsupertramp" on YouTube, has almost 2 million subscribers to his channel, which is stuffed with jaw-dropping stunt videos like "World's Largest Rope Swing" (22 million views) and "Human Slingshot Slip and Slide" (13 million views). Graham started out making unbranded videos, but marketers—including Mountain Dew and Ford—have come knocking, looking to tap into his millennial audience. The latest, released on Monday, is for Bear Naked granola, which teamed up with Graham for a stunt on Mammoth Mountain in California—"human bowling," with people rolling down a hill inside a clear plastic Zorb ball (it's called "Zorbing") into some giant red bowling pins while munching on granola. 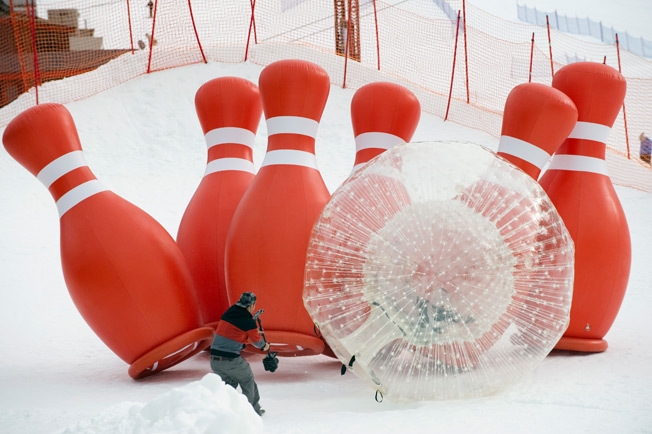 "We'd seen one Zorbing video on snow, but never anything with bowling," said Graham. "We figured, let's make it larger than life and see what happens." COPYWRITING: Graham doesn't work with a script or storyboards. "It's more documentary filmmaking," he said. "We create an awesome experience, we capture it, and then we make a story out of it." The new video begins with on-screen text: "Bear Naked presents Human Bowling." After the pins are blown up and a tractor preps the hill, the action begins—young people in the Zorb ball careening down the hill and into the pins. They're also seen eating granola, laughing and dancing. The party continues into the night. A product shot and hashtag (#OneUpIt) appear on screen at the end, along with the tagline, "Live Bear Naked," and a copy line, "This winter adventure was fueled by Bear Naked." ART DIRECTION/FILMING: Bear Naked handled much of the production, even bringing in someone from Zorb to check the course. "We wanted to make sure it was super safe, because there's always an element of danger," said Graham. He and four friends shot with Canon 5D Mark III and Canon 1D C cameras. (A remote-controlled helicopter got the overhead shots.) The product integration isn't subtle, but Graham said it rings true—people bring granola to the slopes all the time. "If it feels like a straight-up commercial, no one shares it," he said. "If it feels like a fun video that people can relate to, it gets shared." He's also learned not to make the videos too extreme. "You create a cool experience that's larger than life but that people can still believe, 'Hey, I could go out to the mountain and set up something like that with my friends.' That's what people share." TALENT: Graham invited fans to the shoot via Twitter, Facebook and Instagram. "It wasn't actors or people that were faking having fun. It was people legitimately having fun," he said. His directions are generally simple. "It's kind of like impromptu acting, where I'll say, 'All right, I want everyone to run over here and throw snowballs at the Zorb!'" SOUND: The soundtrack is a driving dance tune by Con Bro Chill. "We always try to have happy, positive, uplifting songs that are family-friendly and can hit every audience out there," said Graham. The musical artists in his videos generally license the tracks in exchange for the revenue from iTunes sales. MEDIA: Most brands want Graham to host the videos on his YouTube channel because of his huge audience. Doing so also allows him to present those projects as his own. "It's a win-win for both parties," he said.